In medium bowl, stir cookie mix, butter, egg, flour and vanilla until soft dough forms. Shape dough into a ball. Cover; refrigerate 1 hour. Unwrap 16 hard candies. Crush candies and keep colours separate. Heat oven to 375°F. Line baking sheet with cooking parchment paper. Divide dough in half. On floured surface, roll one portion of dough to 1/8-inch thickness. 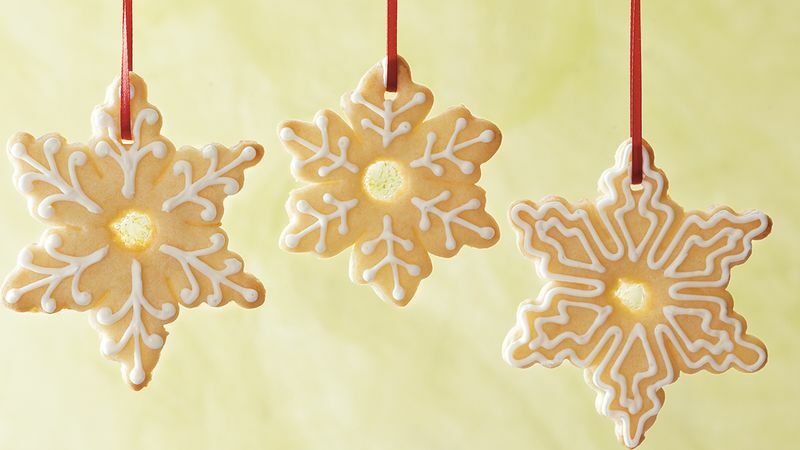 Cut with 3 1/2-inch snowflake cookie cutter with a centre hole. On baking sheet, place cutouts 2 inches apart. Place 1/4 teaspoonful of crushed candies in each cutout hole, filling full. With drinking straw, poke hole close to edge of one point for attaching ribbon after baking. Bake 7 to 8 minutes or until candy is melted and cookies are set. Cool until candies harden, about 4 minutes. Remove from baking sheet to cooling rack; cool completely. Using icing tube with small round tip, decorate snowflake cookies with straight lines and dots. Immediately sprinkle with edible glitter. Let stand until icing is firm.